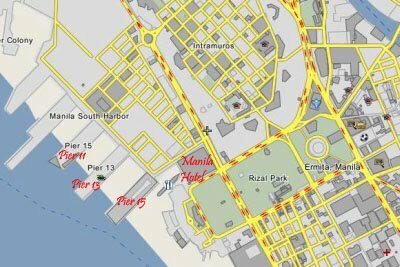 map from wikimapia with corrections on the locations of Pier 15, Pier 1 Pier 11, Manila Hotel, Rizal Park (Luneta) and Roxas Blvd. Commute to Pier 15: take the LRT and get off at Carriedo station, walk past towards SM Carriedo towards Quiapo Church, Hidalgo St and Plaza Miranda then board a jeepney with signboard Pier. Request the driver to drop you off on the street entrance of Manila South Harbor (Landmark: Manila Hotel) then walk towards Pier 15, Pier 13, Pier 11. From Quezon City and Espana, Manila, just board any jeep with signboard Pier (sometimes Pier 15) to get there. From Makati, drive towards Roxas Boulevard all the way to Anda Circle to make a U-turn then turn right to 25th St. and before Manila Hotel. i went on the last day of viewing, and i bet i wasn't the only one who can attest to the ineptitude and stupidity of the organizers. for one, i had to stand in line for 8 hours -- yes, 8 freaking hours! -- just to see galeon andalucia. during that time, i've been subjected to stampedes and rowdy crowds, thanks in large part to a non-existent crowd control system. second, all of us regular visitors had to be under the scorching noontime sun followed by heavy rains, and once it was over, dun pa lang nilabas ng staff ng port area ang silong. third, there is virtually zero system to keep everything in check. and then when it came to view the ship -- 8 freaking hours later without food or water and all sweaty -- we were gladly informed na di na pwedeng umakyat ng ship, and that we had to be content taking pictures na lang for 5 minutes sa concrete ground sa pier 13. super effin stupid ang event na ito. i wasted a whole day, from 7 am to 5 pm, for nothing. seriously, whoever is in charge of this event should be jailed, and NCCA should never be entrusted with event-organizing because obviously it lacks decent brainpower to execute such a simple task. heck, even the queues at Pulp Summer Slam are way better than the hell i've been subjected to just to view this galeon. Hi! Just wanna ask how can i get to Walter Mart near TRINOMA in North EDSA from Pier 2, Manila North Harbor...i prefer travelling via bus or jeep...i'll be travelling during the holy week (on April 5-6 to be exact). Sure wish you can help me!! !